My Holiday decorating is coming along nicely. I've finished the kitchen and I wanted to share my little Nutcracker Tree with you all. I love seeing the twinkling lights at night on a holiday tree. This year the little tree is in the kitchen playing host to my mini nutcrackers. I've added a few DT glittery ornaments. And some artificial poinsettia blooms here and there. This little guy has a string to put his little legs up and down. 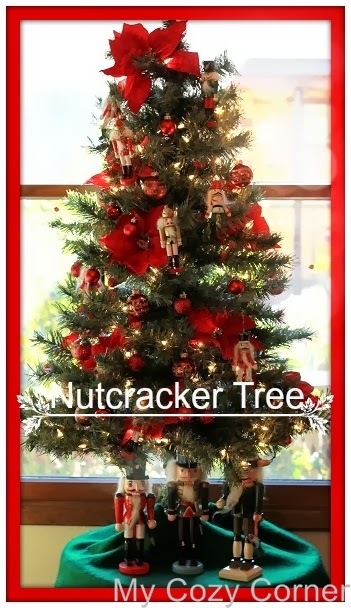 I have three larger nutcrackers guarding the tree on the bottom. Thanks for visiting and I'll be back with more kitchen decor in a few days. What a wonderful idea! Great way to display a collection. I just love a themed tree, and this one doesn't fail! Your collection is amazing! Going to see The Nutcracker Ballet tomorrow evening, can't wait.